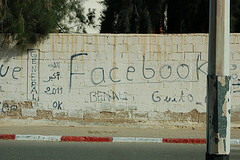 Between August 2011 and January 2012 friends of the page left 348 posts. Simple take home? 90% of the posts we received in that 6 month period were about applying, splendid! These data tell me that our page is totally supporting the current goals we have for Facebook – our strategy is to specifically focus on using Facebook for customer service and encourage prospective students to contact us via the wall. How did we get these data? The hard way – my awesome colleague @idarosqvist went through our page with a pen and paper categorising the posts we had received. Definitely not the world’s most glamorous task but it results in some simple, easy to understand numbers which gives both insight (we’re on target with our strategy) and a set of data which allays the fears of those who worry that our page’s wall is full of random nonsense. If you’ve got a billion friends, and a wall to match, then this probably is not for you; but if you’ve got a ‘regular’ page then taking a foray into your wall, armed with pen and paper, may give you some great insights and some awesome data to report. (We didn’t look at comments, that would have taken too much time. The sentiment of the posts was largely positive or neutral, as tends to be the case with comments as well). Timeline has arrived for pages, and can now be enabled immediately (or automatically comes into effect on the 30th March). There’s already a few Swedish university pages, who are early adopters including Umeå Universitet, Umeå University and Högskolan Väst. Here’s a few of my thoughts. The new pages just look far better, the presence of the larger picture makes for a better visual impact and creates more opportunities for associating the page with campaign imagery used elsewhere. 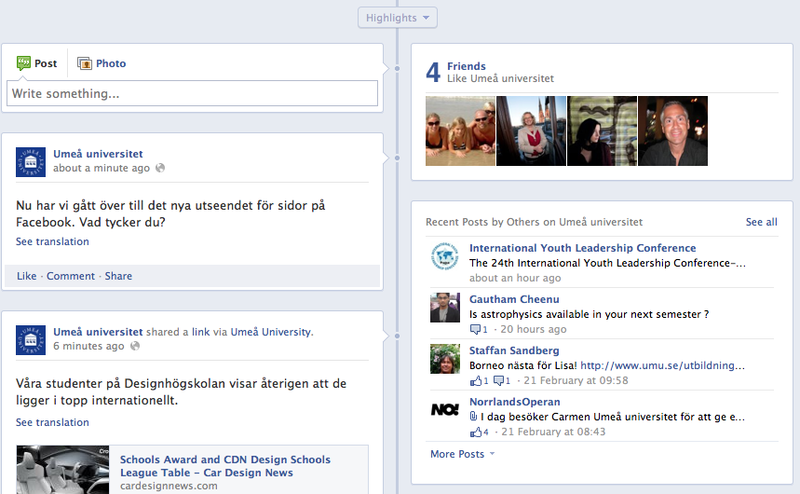 Umeå university's Swedish Facebook page with timeline activated. This is the part which worries me. All the pages I’ve looked at, which have timeline activated, now show comments in a separate box called ‘Recent posts by others’ with a truncated snippet. If you’re using the page as a service platform, as my employer does, then there could be a risk that the first time visitor does not get to see that posts are answered quickly and with good answers. Timeline places a greater emphasis on posts from the page owners which may not be the main priority of all pages – this has implications for your content and posting strategy on Facebook. Tabs also, are not as obvious as they were previously. Landing pages are now a thing of the past but you can get more data from a page’s insights tab, as a page friend. The completely awesome allfacebook blog is an extremely useful source of information about this, but it’s also worth checking out Facebook’s own guidelines for Timeline (which includes what you can and cannot do with the picture). First – there’s a ton of data missing; I certainly will have missed pages, nor have I spent time looking at how many Facebook pages a kommun might have. Nor have I made any kind of assessment of their overall communication strategy (they may stink at Facebook but throw great parties). I tried to check but it may well be that the pages I understood to be representing the Kommun are entirely ‘unofficial’ and actually administrated by small dogs. Second – I’ve only looked at number of friends (not a particularly sharp metric) and number of posts left by page friends (a slightly better metric, but I only looked at February). I’ve not looked at comments left on posts (life is too short). Third – I’ve not looked at the age of the pages, so the friends metric is pretty useless for figuring out growth rate. Here’s all the data in a spread-sheet. Hat tip to Obiz24 for publishing their survey of Swedish kommuns, which got me off to a good start. Click on this to get a bubble representation of the number of Facebook friends these Kommun pages had in Feb 2012. Karlstad Kommun’s Facebook page stands head and shoulders above the others with just over 12282 friends, way more than any of the others I looked at; most struggle to get more than 1000 friends. No surprise, they also had the most posts left by page friends. According to Wikipedia, there are 290 Swedish Kommuns, with a massively varying population in each. If one assumes that most of Karlstad’s Facebook page friends actually live in the kommun then they have around 14% of their citizens as friends – definitely a significant communication channel. Not everybody enjoys such success – Eskilstuna, with the second most Friends, theoretically only has 2% of their citizens as Friends. Click to see number of posts left on the Kommun Facebook pages, during February. 12 of the Kommuns I looked at have their walls well and truly shut, with no posts allowed. Another 21 Kommun pages failed to get any posts from their friends in February (remember, I’ve not looked at any other months or comments left on posts). Generally, the amount of posts is quite low. Several of the Kommuns have a few ‘activists’ who post several times. Lots of Numbers – So What? How do you use this? First, given the large amount of energy often expended on discussing how social media is used in the public sector it’s a provoking reflection that – with regards to the Facebook pages I looked at here – the direct audience (i.e. the total number of friends) seems to be quite low. Second, with a few exceptions the level of engagement (‘shudder’ – what does that word really mean?) is also low – page friends do not seem to post or comment that much. If you’re investing in your Facebook page then you could maybe use these data as a benchmarking tool, and spot those kommuns which seem to be having success (though it all comes back to your strategy and goal). Is your page missing? What would make this analysis more useful? Have I made a colossal #fail? – let me know in the comments box below! Swedish University Facebook Pages Review – Posts in January 2012. Here’s the data for January for the Facebook activity of Swedish universities, ranked by the number of posts left on their walls. December was relatively quiet in comparison to January; some pages received more than double the number of comments in January, compared to December. (December’s data will be presented in a review of the previous 12 months which I’ll prepare next month.) International pages are the most active, which is no surprise, given that this is the main application period. 5 university pages still do not allow posts to be left. In January, the pages with the most posts were Malmö (112 posts) and Uppsala’s (104 posts) English Facebook pages. Uppsala experienced considerable gains from last month, with an increase in 30% in the number of posts. Lund University’s page is ranked 3rd, with 67 posts. What’s the Value of this? Well, that kinda of depends on you. If the aim of your Facebook activities is to build a relationship between yourself and prospective students then you’ll probably want to see lots of posts on your wall. If, on the other hand, you are more interested in profiling your university online then you may be more interested in comments and likes – though posts will still be important – in getting a more viral effect for your content. So, only a few comments may not necessarily mean bad things (and you may well be being awesome on other channels) but it could equally be a sign that, currently, you have not given any compelling reason why people should connect with you on your wall. In a subsequent post I’ll be showing a simple way of evaluating a page, and presenting the results, to get a handle on the type of posts being left. I’m putting together the latest results of my review of Swedish university Facebook activity, in the mean time here’s an overview of page growth – measure by friends – from a selection of English language Facebook pages maintained by Swedish universities. Swedish university 'English' Facebook pages - number of friends. Click picture to make it less squinty. As usual, if you see any errors or #fail in the data – please let me know! This kind of data will be included in a year in review report I hope to publish later in the spring. Here’s the November ranking for Swedish universities’ Facebook pages – based off the number of comments which their friends left on their walls, during the last month. This does not include comments left on posts by the page, or additional comments in a longer discussion. I’ve divided it into English and Swedish language pages. 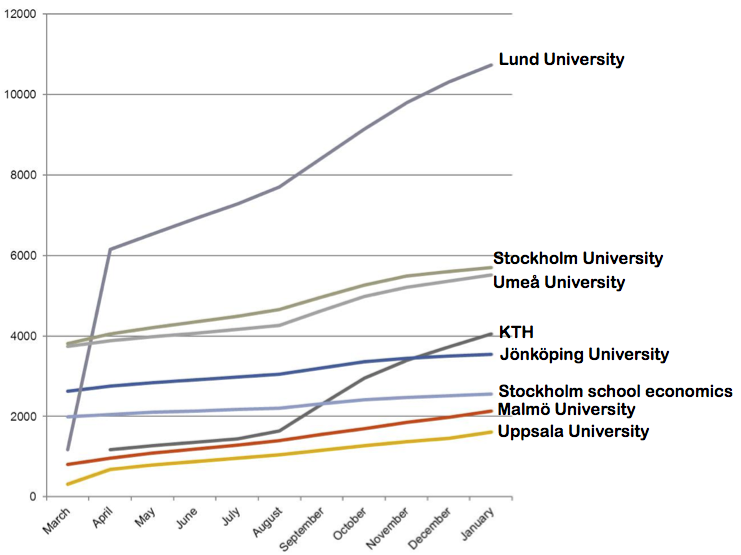 Overall, Linne Universitet’s wall saw the biggest increase in posting, with a growth of 20% since last month. There’s some international activity on the wall, which contributes to the growth, but the content seems to be mostly from students on campus; for example the sharing of blog posts or for sale notices. The Karolinska Institutet, The Royal College of Art and Stockholm’s Universitet’s walls remain closed for posts. Malmö University sits at the top of this part of the ranking, with a page where posts are almost entirely questions about studying at Malmö, or how to make an application. Lund University, in second place, also has a wall dominated by questions about applying to Lund. Uppsala, whilst enjoying fewer posts, shows a similar trend towards questions about making an application. Stockholm University and the Stockholm School of Economics walls’ remain closed. A few things occurred to me when I was preparing this month’s ranking. A high number of friends is obviously great for reach and getting your content visible across the web. Lund University, for example, gets a high number of likes and shares for some of their posts which presumably leads to a healthy amount of inbound traffic to their page, and website. But, once again there’s little relationship between number of friends and number of posts; Lund University has 5 times as many friends as Malmö University, yet they both have similar levels of posts. The student’s question that you ignored or dismissed with a short, terse answer? There’s another university giving them red carpet treatment. In the last month I noticed, on several different occasions, the same student posting the same question on different university’s walls (yes, your customers are fickle – get over it). The tone and level of support tended to vary. Enough to make them not choose your university? Hard to say; but maybe enough to drop you from 1st to 2nd choice. Exceed the expectations of your Facebook friends, the extra effort does not cost much and will reap rewards. Chances are, the page I include here isn’t your only one – you’ll have an ecosystem of different pages representing Faculties, programmes or research activities, for example. Quick tips – make sure your pages are liking each other; don’t rely on the Facebook search engine to show up your other pages. Also, encourage cross posting from one page to another; get administrators from a particular page to post, using their own page’s identity; when appropriate this is a powerful way of drawing attention to the competence and presence you have on Facebook. It’s just an arbitrary threshold, but the Lund University marketing team have something to celebrate as they manage the first university Facebook page, in Sweden, to have more than 10 000 friends. In the last month they gained over 500 new friends, which pushed them up to 10 300 friends. It’s interesting that the first page to achieve this is an English language page, rather than a Swedish one. Even though the need for communication with the university is higher for international students, the number of Swedish speaking students would – you’d think – mean that the universities’ Swedish pages would be larger than they are. Something like 95% of our youngest target group (Data from Svenskarna och Internet 2011) for bachelor degrees, are using social networks in Sweden – so why their absence from these pages I wonder? All of the universities’ Facebook pages – regardless of which language they use – are showing a reduction in friend growth compared to last month. This month, Göteborg Universitet, KTH, University of Borås, Malmö University and Jönköping show some of the highest percentage growths; but, in real numbers of friends, some of this growth is very small. If you’re working to get more friends, then maybe you need to revisit your strategy, or not, as the case may be (Though it’s worth repeating that the total number of friends should not be the metric you’re focusing on to measure your page’s success). I’ll be following this post up in a few days with an analysis of the commenting frequency on these pages (altogether more relevant than just looking at numbers of friends) – I just know you can’t wait. If your page is missing, just let me know in the comments, thanks. Facebook Pages in English, ranked by number of friends. Facebook Pages in Swedish, ranked by number of friends.